Motiga hosted a Reddit AMA about Gigantic yesterday, answering many questions about the future of the upcoming shooter MOBA. As hinted in the headline, VP of Product Development James Phinney explained that there will be probably have to be resolution compromises to keep Gigantic running at steady 60FPS on Xbox One. We’ll see, but I would expect some resolution compromises for steady 60 fps, especially in the thick of combat. CEO Chris Chung, on the other hand, confirmed that Motiga is not currently using DirectX 12 on the platform. We currently use DirectX 11. He also added that the recent layoffs will not affect development. While we had to go through a painful restructuring where we lost a lot of good friends, we made sure that the decision had no impact on development. We are moving forward full throttle on the development of Gigantic. As a matter of fact, our development has accelerated as we are getting used to the new platforms. We also paused beta so that we spend as much time on development of the game as possible. My opinion is that games don’t fail because of competition, but because they don’t deliver the games that customers want. There are great titles coming out next year but there will always be great titles coming out. 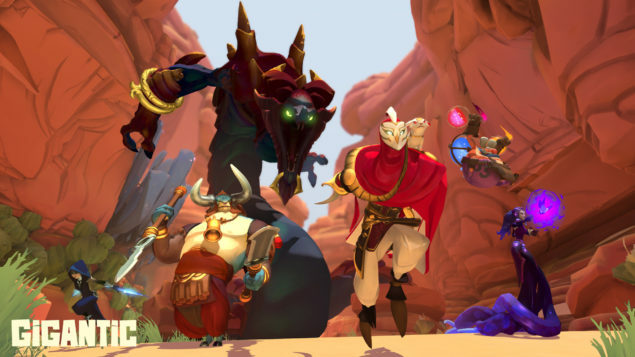 Gigantic will fail if we don’t deliver an awesome experience, not because of other games. Major changes to the way power is generated for Guardians for more interesting and competitive matches. We’ve focused the game on active play by rewarding more power from kills and a new power orb mechanic and less on passive factors like power generation from creatures. Big content updates, including a second map (Sanctum Falls, formerly known as “MistForge”), a new hero, and a new summonable creature. The naga guardian Grenn will also be showing off new and improved visuals and abilities. The first parts of our account progression system, where we’re working to make it fun to earn and unlock rewards as you play. This version is just a first iteration, but I think you’ll see we’ve designed a reward system that is fun and complements the overall play experience. Numerous gameplay adjustments to improve playability. This includes a lot of work to bring joy back into moving around in Gigantic, with reduced stamina costs for sprinting, the removal of penalties for jumping when out of stamina, and much simpler, cleaner collision in our maps. The ability to invite your friends and form a party will also come back next year. There’s more, though: Motiga is also working on making the faction Guardians more active during the matches. More active Guardians would not hang back nearly as much as they do. The thing we just got hooked up this week is them moving into a more forward position as they gain more power. (And then when one gets full power, the other one retreats.) That alone has been a big improvement. In addition to that, the Guardians should move around more in the areas they occupy and have more interesting attack patterns. Gigantic is set for a release on PC and Xbox One at some point in 2016, with cross-play fully enabled via Xbox Live.